What is in the green container? ahhh I wish you were my mother!!! You should open a restaurant! Or a catering service!!! That loaf generator thing rocks. How clever are you! I was just thinking tonight that I wanted a loaf, actually I wanted burgers. Can these loaves be turned into burgers? Thanks! Wow! Bordom beget the Magic Loaf Studio. Awesome. I've been making a vegetarian "meat loaf" for years. I use TVP as the main ingredient for mine. You're right, it's always better the next day. The green container holds the Aplets & Cotlets. The Magic Loaf Studio is great! His lunch looks comforting and yuumy, like lunches from my childhood. >>Can these loaves be turned into burgers? Yes! You might need to add extra bread crumbs or binder and less liquid, so you can shape it into patties with your hands. what a stupendous idea! am def. printing this out and using it ALL the time!! :) thanks! I love pick one from column A kinds of recipes. This is gonna be fun. I may have to make it tomarrow night instead of what I had planned. Are crimson lentils the same a red lentils? I bet the cream of wheat as a binder is uncooked that cooks very quickly. So exciting! I can't wait to try it. :) Thank you for sharing! That site rocks! THANKS, Jennifer! I can hardly wait to try our family creation. We huddled 'round the computer and all contributed. Shmoo's lunch looks awesome as usual. Would you start out with an equal ratio of the protein to carbohydrate? Ever tried Happy Chicken Burgers (or loaf) (or fingers)? They sell these burgers on Ezekial buns or fingers with honey mustard sauce for dipping at our local Lifesource Natural Food Store and Deli. >>Are crimson lentils the same a red lentils? No, they aren't husked like red lentils are. They're smaller than regular green lentils and are darkish red. I like black lentils, too, and the pretty blue-green French lentils. Lentils are so fun! Wow, that magic loaf studio thing is really cool! I was never a fan of meatloaf.. ever. Does it taste close to it? If it doesn't, then I'll give it a try. >>Would you start out with an equal ratio of the protein to carbohydrate? Hi, Beth! No, it's a two-to-one ratio (2 cups protein, 1 cup carb). Loaf generator looks great but nuts are a no no in this house so is it possible to skip the nuts? Maybe a dumb question - but do you have to cook the loaf or does it "set up" on its own? The Magical Loaf Studio is so cool! I can't wait to try it! wow what a wonderful, thing that loaf studio you made is thank you so very much for sharing!!! OMG. I love this! Thank you! I haven't tried this yet, but does it not sound YUMMY? Preheat the oven to 350º. Oil a loaf pan or spray with nonstick spray and set aside. Grind the pine nuts into a coarse meal using a food processor or spice/coffee grinder. Place in a large mixing bowl and set aside. Sauté any vegetables you've chosen in the olive oil until soft. Add to the large mixing bowl along with all the remaining ingredients. Mix and mash together well, adding only as much liquid as needed to create a soft, moist loaf that holds together and is not runny. Add more liquid or binder/carbohydrate as needed. Press mixture into the loaf pan and bake for 45 minutes to 1 hour, or until cooked through. Cold leftover slices of Kira's Waiting for the 7:21pm Bus Loaf make a great sandwich filling. Your skill and cunning are amazing. Love the loaf generator. >>but do you have to cook the loaf or does it "set up" on its own? Yes, the loaf is baked for 45 min. to an hour to "set" and cook through. As a Seventh-day Adventist myself (yes I'm that too) I second the loaf as a SDA thing! We have WAY to many of those, IMHO. However, I will ask DH if he would like an old fashioned loaf and if so, use your generator to make one. Wow! That's all I can say! oh, and thanks! Hi- This is my first time posting. I’ve been a longtime reader but decided to finally post. I’ve never seen anyone mention natural food buying clubs and I belong to one that is great so I was curious if anyone else has heard of them? I have some (okay, a lot) info that I would be happy to pass on if anyone’s interested. Some of you have mentioned that it’s hard to get natural/organic foods in your area but buying clubs can be a great resource. If you want more info, let me know. I've been following your blog for a couple of months & I have to say I'm enthralled. 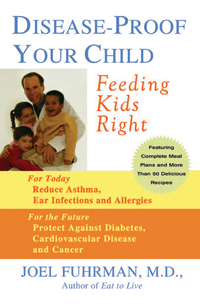 I admire the way you teach your child to eat healthy. I'm also an SDA, hahaha, we've come out of the closet apparently now. And we have a great health message, that's for sure. the loaf generator is out of this world!! How freaking fun! I sense that my poor, unsuspecting boyfriend is headed for a loaf season! This is brilliant, I have been looking for a loaf recipe that looks good for awhile, I always seem to find ones that taste abit like packaging material. My dh is a carnivor so finding things for his is always a plus. But it's just in time for us in the southern hemisphere, freezing our butts off and needing good comfort food! Thanks! The loaf generator is very cool. I'm sure I'll make some horrble things the first couple of times, but it's handy since I've a fair few intolerances. i am in love with the magical loaf studio! i can't wait to try it. i have been missing the various veggie loaves the chicago diner makes (i used to visit my parents in chicago, but they moved). yummmm. I belong to, am actually the coordinator, for a natural foods buying club. They're great and I highly recommend one. Thanks so much for the loaf generator! I can't wait to try it. I've been vegetarian for over 14 years, but have NEVER made a loaf! Thanks again for all your inspiration. 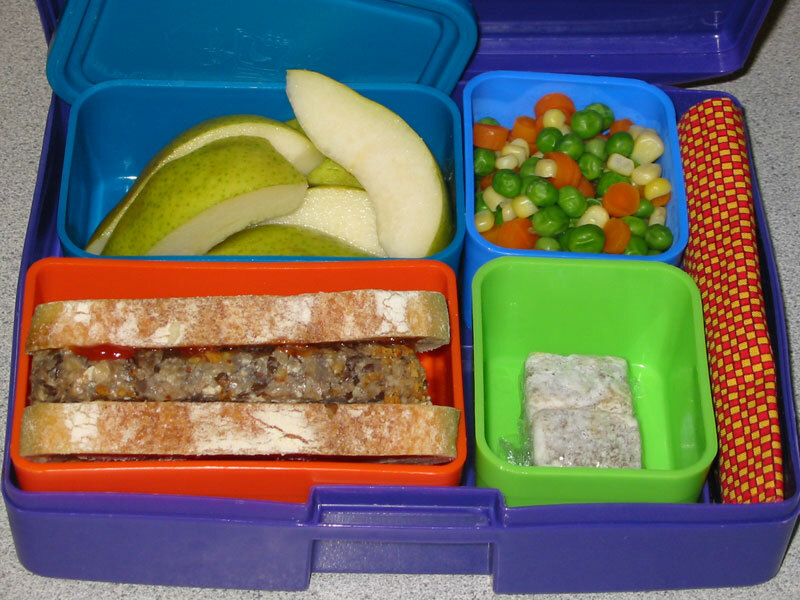 My daughter's lunches are so much healthier and exciting since I started reading your blog. Keep up the great work! When is your book coming out! Yum! Can't wait to try some of the myriad combinations. You're too incredible, creating that magical loaf studio! Applause! Grind the cashews into a coarse meal using a food processor or spice/coffee grinder. Place in a large mixing bowl and set aside. The Loaf Generator is great. I think I'm having cold sammiches for lunch next week, with ketchup! Thanks so much for making the studio! I've never made a loaf, I've always been a bit scared of them, but I love that you've given me so many options to try! Awesome lunch, Mrs. Schmoo! I myself think Aplets and Cotlets taste like fruit flavored dirt, but I realize I am a heretic and don't begrudge others their joy. That sand, on the other hand, is seriously calling my name! Oh, how I love loaves... of pretty much anything! Way to ignore the sweat and cook up yet another great lunch. This is the answer to my prayers! (no pun intended :-) ). My ds has multiple food allergies so I am often at a loss of what to make. I plugged in the things he can eat and out popped a recipe that looks great! Thanks! Been checking your site for a while now and love it. Keep up the excellent work! Do you ever teach any vegan cooking classes? If so, I would love to attend. I'm neither vegan or vegetarian but the loaf sounds so yummy! 1) This blog is absolutely awesome, thanks for doing it and sharing your cooking! It's so inspiring and motivates me to try to cook at least 1/3 or half as well to my boys (although we're not fully vegan yet). 2) Your Loaf Studio is AMAZING!! 3) Loaves are a distinct feature of North-American SDAs, I'm an SDA but I'd never heard of them until I came to this country (I'm from Brazil). I have yet to acquire a taste for loaves - maybe your studio will help! What a great concept! I am always at a loss to know how to make a decent vegloaf and now I have this. I have shared the link with all my friends, have generated my own first loaf and copied down the others I see here. Thanks so much for doing this. On a side note, we (my daughter's other Girl Scout leader and I) loved the lunchbox idea so much that we turned it into an eco-awareness project for the girls to earn a badge and sent it out to everyone in the school (small town), we're hoping to seriously reduce the trash in school plus promote more healthy eating. Thanks for all you do and all your ideas. Oops, you're right! It should be fixed now if you hit refresh and reload the page. brilliant! i love the menu concept. i printed it out, & can't wait to try. thanks so much for sharing your creative ideas here. Completely addicted to your blog, Jennifershmoo! I'm wondering whether you've tried freezing these loaves. We're expecting our second little boy in a few months and it'd be nice to have some ready in the freezer. Sidenote> My first loaf from The Magical Loaf Studio (red lentils, carrots, garlic, extra ketchup, wheat germ, etc.) is in the oven now, and it smells wonderful! I'll have to ask my baker hubby to bring home some rolls for sandwiches! As TW asked, do the nuts serve an essential purpose in these recipes? Sauté any vegetables you've chosen in the margarine until soft. Add to the large mixing bowl along with all the remaining ingredients. Mix and mash together well, adding only as much liquid as needed to create a soft, moist loaf that holds together and is not runny. Add more liquid or binder/carbohydrate as needed. Cold leftover slices of Sadie's Smashing Success make a great sandwich filling. My combination was sesame seeds, brown lentils, brown rice (rinsed and fried on high heat before boiling, to bring out the “nutty” flavour), carrots, celery, roasted garlic, onion, a red thai chilli pepper, and liberal amounts of nutritional yeast. I spiced it with chipotle powder, onion and garlic powder, a shovel-full of zatar, some “fine herbs” mix, rosemary, ketchup, mustard, and vegan Worcestershire sauce. Didn’t bother with the liquid, cuz it looked pretty good as it was (the rice was rather wet). Aaaaand: it turned out deliciously nutty and spicy! Thank you for the awesome loaf-making program, I’ve had NO luck with tofu loaves in the past (always turned out way too soggy). This, however, is a loaf to love. Oh, I'm ridiculously excited for the magical load studio! I recently made a lovely lentil loaf. My Sprout(4) dubbed it "SpaceCat" and they gobbled it up. While it's lovely that naming it after he and his sister's favorite things, it makes it sound a bit less veggie... Thank you for this blog! I'm going to try an oat, red lentil, and cashew mix. Cold leftover slices of My first magical loaf! make a great sandwich filling. *sings* have i told you lately that i love you? oh jennifer shmoo, this is amazing! I'm set for dinners from now until eternity! yummo... and all with ingredients from my own cupboard! thanks a MILLION for this! i can't wait to try it.. and try to eat just like lil shmoo! I made my loaf! Kira's Waiting for the 7:21pm Bus Loaf, that is, featuring pine nuts and garbanzos and Italiany spicing... and it ROCKED. Hard. Jenniferschmoo, you are a genius! Thank you! Wow, as of this morning 2,800 magical loaf recipes have been generated! The second replaced oatmeal with quinoa as the grain, and I decided that though it is edble, I don't care for the texture near as must as that first savory bite of oatmeal-only loaf! Anyway, just had to say I'm now a new, big fan! I made my first loaf today. The taste was delish but the texture . . . it was not loaf like but fell apart so it was like eating a plate of lentils (which is fine but not what I wanted). So my question; was it too much kasha, not enough tomato juice or should I have cooked the lentils longer until they were basically mush? I'm not sure what the rest of your ingredients were, but it sounds like you need more "binder", something that will help it hold together. And yes, it helps if the lentils/beans are very soft so you can mash everything up together. Like I mentioned, I can't vouch for every loaf combination, so sometimes you might have to make adjustments as you go, throwing in more liquid or binder or carb (some of the carbs act as binders, too, especially breadcrumbs and oats). Lentils and kasha sound great, though! just to briefly sum up my foray into loaf baking tonight, i tried chick pea, rice, veggie (including mushrooms), flax meal, olive oil, walnut, nutritional yeast, veggie worcestershire sauce, veggie broth...i think that's it -- anyway, it was a HUGE HIT. yum yum yum yum, is all i can say. the only downside was no leftovers for sammiches. OOPS Jennifer, I ment to post the recipe. Here was our dinner from last night along with boiled potatoes tossed in unsweetened soy yogurt and green garlic. I also roasted carrots, onions and celery which is what my Mom used to put along side her meatloaf. Next time I make this I'll cook the lentils longer to make them mushier and may use more soy flour. The loaf lost it's loaf like qualities when sliced. Grind the walnuts into a coarse meal using a food processor or spice/coffee grinder. Place in a large mixing bowl and set aside. Cold leftover slices of Pick One from Column A Loaf make a great sandwich filling. Thanks! That's two votes for uncooked Cream of Wheat. I'll update the form. I made a loaf for the first time and I was super pleased with the results, especially in sandwiches the next day. I used: cooked split peas (which were boiled with cilantro sprigs, 2 slightly crushed garlic cloves and a bay leaf), wheat germ, walnuts, onion, garlic, carrot, celery, jalepeno, veggie broth, cumin, nutritional yeast, curry, afoestida (sp? ), fresh cilantro and a dash of dried coriander, Bragg's and vegan non-hydrogenated margarine. My hubby and I both liked it. Quite good with cilantro chutney, cucumber and avoado on toasted french bread the next day. Ooh, that loaf sounds fabulous with the curry and cilantro! Yum! Sauté any vegetables you've chosen in the vegetable oil until soft. Add to the large mixing bowl along with all the remaining ingredients. Mix and mash together well, adding only as much liquid as needed to create a soft, moist loaf that holds together and is not runny. Add more liquid or binder/carbohydrate as needed. I made Erica's loaf the other night and it tasted really good but it didn't really turn out loaf-like, which we would have preferred. It was more spoonable. I only used about a half cup of veg broth because it seemed like it was sticking together pretty good. I also only used the heaping tablespoon of ground flax seed, should I have used more? It was still very tasty and I will most likely make it again but would like it to stick together more. Any suggestions? If you like your loaf to be firmer, make it in a 9x13 pan instead of a regular loaf pan (like you bake bread in). The loaf gets crispier that way. I grew up eating this kind of food and my mom rarely made a loaf in a loaf pan. I made up and made one of these loaves - it was way too squishy. Next time I will make it in the flat pan. Also, if you like really crispy loaf, make it in muffin tins. Meat eaters really prefer these - at least in my family. I tried my Terrific Tere Loaf (or Terrific Loaf a-La Tere, I can't decide) and it was *fantastic*. I've tried veggie loaves in the past and they were all a little dry--this one had the perfect consistency, flavour, and was so moist!! I was SO impressed, and will definitely be making more of these and experimenting. I served it with boiled potatoes, broccoli and vegetarian gravy (I used the Mushroom Miso recipe from May All Be Fed by John Robbins). I cooked the kasha and oatmeal, and chopped all my vegetables in the morning, so preparation was pretty quick, although there are probably combinations that would be a lot quicker to make. I just made my first Magic Loaf tonight and it's absolutely delicious! Thanks so much, Jennifer! i used to be a vegan for 12 years, and so i appreciate the resources you have on your blog, which remind me of my previous healthier lifestyle. incidentally, i am an Adventist, so you can understand the influences of my past vegan practice. i've linked your blog to my piegirl.blogspot.com and you might be interested to see a link there to www.cookingcute.com which features a collection of bento meals. i will be sharing your blog with my sister, who has two school-going children. thanks for sharing! I've noticed you do alot of combination soups. Can you do a soup generator?? I just came across your site yesterday and I trying to get caught up with you. I read until 4am last night! I can't wait to be current and order the cookbook!! Anyhow, soup generator = Mmm Mmm Good! Your Web site almost saved Christmas! This year it was just me and my daughter for Christmas, so I was free to make anything without comments from my husband. I had tried various loaf recipies with varying degrees of success. Then, yesterday morning, I found your amazing Web site! So I just checked off ingredients that I had on hand, and it generated a recipe for me! I had some burger crumbles, but only 1 cup, and I needed two, so I used one cup of burger crumbles and one cup of firm tofu, cashews, oatmeal, flax meal, onions, carrots, garlic...mmmmmmm! It was yummy! I served it with vegan "turkey" gravy, cranberry sauce, veggies, and potatoes. Thank you for your wonderful recipe generator! OK, I'll be honest. I'm not a vegetarian and even less of a vegan but I'm SO EXCITED about this website! I'm off to make a loaf now! I'm a SDA too and I LOVE loaf! What a wonderful Sabbath lunch, praise the LORD! I'm a little new to the kitchen and I'm just wondering how much dry beans equals two cups cooked beans. May the Lord continue to bless you through your ministry. Ha! this is great and making me hungry. As a kid growing up in the SDA church and school, I ate a lot of these - usually at my grandparents! Now that I am a vegetarian, why do I never make them?? It is time! I couldn't find an email or contact form link so must post here. I used your magic loaf idea to create my own with a less vegan influence. I also included a fill in blank for each ingredient category so folks can fill in their own. I acknowledged you and posted a link back to your magic meat loaf page. My website is not high traffic - I just did this for myself and friends mostly. Thanks so much for the idea and the recipes! i tried to read all the comments but i may have missed this. any directions for the best way to freeze loafs or if they freeze well? i love love love this loaf generator and have been making super yummy loafs with it. i am finding when i use quinoa i need extra binder and so far i always use flax meal for my binder. the loaf studio is the most popular clickout on this page: lens photothanks for sharing!! I love your blog and the Magical Loaf Studio is ingenious! We've made several delicious loaves with it--thank-you!! I was going to send your website for the Magical Loaf Studio to a friend, who loves nut loaf and it's not there anymore! What happened? I love your loaf builder! ....simply amazing! I love love love your magic loaf site. I tried my first recipe tonight, with slight variations, and I think it's ridiculously delicious. 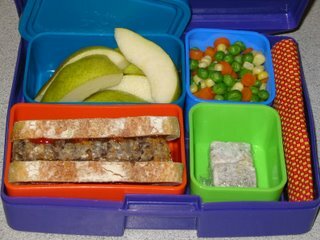 Looking forward to packing my son's lunch with it for preschool (where they gave me my first bento box; they like to encourage parents to use re-useables and they like the laptop lunches brand b/c the teacher only has to open one lid). The leek is super delicious. Also, I sauteed the mushrooms separately so they wouldn't steam (a la Julia Child). Oh ! this is a GREAT web-site ! Thank you. I am an SDA but it hard to find a vegen loaf that I can tolerate. Your site has come to my rescue. Boy, putting uncooked cream of wheat (I used malt o'Meal) it makes the texture real nice. Neat new combinations. thank You. So when the recipe calls for 1 cup cooked grain, does that mean I measure 1 cup dry grain and cook it? Or cook about 1/2 cup dry grain to make 1 cup prepared grain? And approximately how much does this recipe make? I want to make it in mini loaf pans and freeze them for individual meals. Thanks! It means 1 cup of grain that has already been cooked. So cook some grain and measure out 1 cup and you've got it. It makes one loaf pan, probably 4 or 5 mini loaves. And the loaves usually freeze well, too. I absolutely love your Magic Box Loaf! I am wondering why whole wheat flor is not given as as option for the flours. I have used it several times as that is what I have had on hand. After searching the web for almost two hours to find a veggie burger/loaf recipe with ingredients that I had on hand... I came across your loaf generator! Thank you so much for taking the time to program that! I am presently eating my lentil loaf with salad. SOOOOO good!! I have bookmarked your page and will return. Nancy -Brilliant! ...create your own loaf. We are vegan and we have so many people who have difficulty creating their own loaf to cook for dinner. What a marvelous way to show how to create a dinner loaf that has all your protein, carbs, vitamins and minerals, amino acids all included. Thank You so much for this information. Hey, I want to make a loaf for christmas. How many people feeds one recipe? Is the recipe for one big loaf? Or should I double(or quadruple) it to feed 4 people?